1 1/4 cups Hormel 25% Less Fat Sliced Pepperoni - Comes in 6 oz. bag. 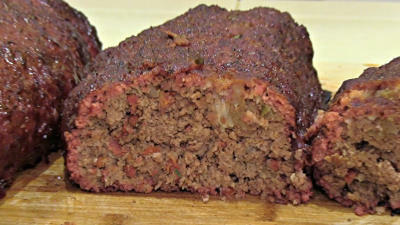 Here's a low carb tasty twist on meatloaf and it's loaded with flavor! Let's start by making the sauce. I recommend doing this several hours before the start of the cook if not a day in advance. This will allow for the spices to meld with the sauce. In a medium mixing bowl mix the following ingredients. Place 8 oz. of the sauce aside. 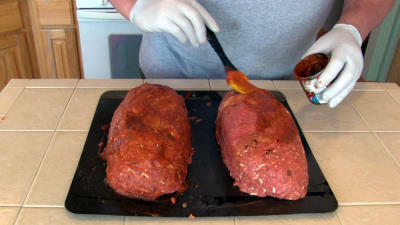 It will be used to coat the exterior of the meatloaf. Cover both with plastic wrap and let stand in the fridge for at least 4 hours. Dice 1 cups worth of sweet onion and 1/2 of an Anaheim pepper. Make sure to de-seed the pepper prior to dicing. Dice 4 oz. of sundried tomatoes. These usually are in a jar packed in oil. 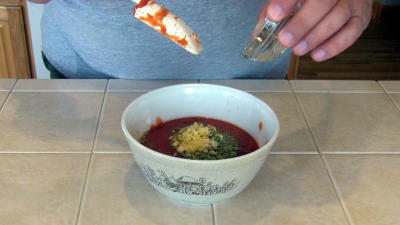 Using a fork, fish them out allowing as much of the oil to drain off as possible. You will use approximately 1/2 of the 7 oz. jar. I used the Safeway Select brand found at my local Safeway store. Next cut up 1 1/4 cup of pepperoni slices. I used the Hormel 25% less fat pepperoni that is pre-sliced and comes in a 6 oz. re-sealable bag. In a medium pan melt 2 tbsp. butter over medium high heat. Do not burn the butter. 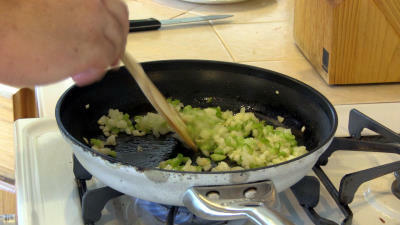 Add in the sweet onion and Anaheim pepper and sauté until the onions become translucent. Remove from the heat and let cool. In a extra large mixing bowl place the 7 lbs. of 80/20 ground beef. Using your fingers, poke a bunch of holes into the ground beef. Pour the sauce over the beef allowing it to seep into the holes. Add the sun dried tomatoes, onions and peppers. Using your hands thoroughly mix the beef. Pour the bag of Baken-Ets into your blender and crush them up using pulse mode. 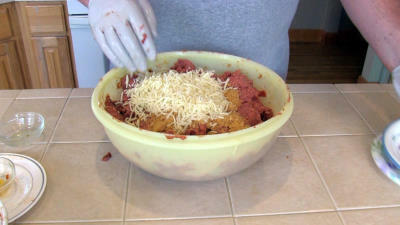 Add the crushed Baken-Ets and 2 cups of Mozzarella cheese to the beef and thoroughly mix. Cover with plastic and place in the fridge for a couple hours to allow all the flavors to meld. 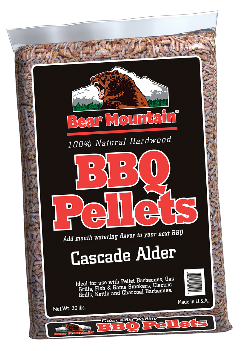 After the beef has had time to sit in the fridge, pre-heat your cooker to 250 degree F. In this cook I used Bear Mountain Cascade Alder BBQ Pellets. Place the beef on to a cookie sheet by turning the bowl upside down on to the cookie sheet and shaking it until the meat falls on to the cookie sheet. Divide the meat into two equal portions and form two uniform loafs. Coat the outside of both meatloaf's with the 8 0z. of sauce you set aside. Shake pepper on each meatloaf to taste. 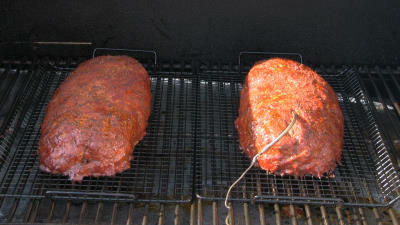 Transfer the meatloaf's to greased smoking racks if you have them. Place the meatloaf's into your cooker which should be pre-heated to 250 degrees F. Cook until the internal temp reaches 160 degrees F.
This is a very easy recipe to make and requires just a little preparation time. 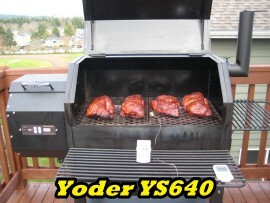 Cook time roughly 5 1/2 hours @ 250 degrees F.